An SNP MP has urged the prime minister to tell the head of the Royal Bank of Scotland that its recent decision to close branches is unacceptable. Ian Blackford, the SNP's Westminster leader, told Theresa May that RBS was "turning their backs" on communities. And he called on her to tell RBS chief executive Ross McEwan that the closures must be reversed. Mrs May responded by saying that branch closures were a commercial decision and that alternative services were in place for vulnerable customers. But Mr Blackford said the bank was now closing 259 branches across the UK - including 197 operated under the NatWest brand. He added: "If the prime minister recognises the importance of this, she should be summoning Ross McEwan into see her and making it clear that we will not accept towns and villages up and down the United Kingdom losing banking services. "There are 13 towns in Scotland where the last bank will be going. "This is not acceptable. It is about time the prime minister accepted her responsibilities." He went on to ask: "Given we are the majority shareholder, will the prime minister step in and tell the Royal Bank of Scotland to stick to their commitment and not close the last bank in town?" When it announced the closures, RBS said the number of customers using its branches in Scotland had fallen by 44% since 2012, while the number of regular mobile users had increased by 39% since 2015. And it said it was "investing in our more popular branches and shaping our network, replacing traditional bricks and mortar branches with alternative ways to bank, including community bankers, mobile nank on wheels, and post offices, so that we can reach even more customers". Responding to Mr Blackford, the prime minister said the decision to open and close branches was a commercial one taken by the bank, without intervention from the government. 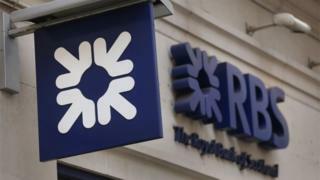 She said: "But we do recognise the impact this has on communities, and the secretary of state for Scotland raised concerns that the House have expressed on this issue in his meeting with RBS. "Of course more people are banking online. This is having an impact, but we do want to ensure that all customers, especially vulnerable ones, can still access over the counter services." Mrs May later stepped into the debate about taxation in Scotland, saying Thursday's budget would be a "real test" for the Scottish government, which is widely expected to announce income tax increases for higher earners. The prime minister did not say what the level of taxes should be in Scotland, but added that the Scottish government would be watched very closely.